ERNARD was born at the castle of Fontaines, in Burgundy near Dijon, in 1090. The grace of his person and the vigor of his intellect filled his parents with the highest hopes, and the world lay bright and smiling before him. But Bernard renounced it forever to join the monks of Citeaux, a few miles distant. Four of his brothers and a group of friends, thirty young Christians in all, went when he did to Citeaux, leaving the youngest brother, Nivard, to be the mainstay of his father in his old age. “You will now be heir to everything,” they said to him as they departed. “Yes,” said the boy; “you leave me the earth, and keep Heaven for yourselves; do you consider that fair?” And he too left the world. At length their aged father came also, exchanging wealth and honor for the poverty of a monk in the monastery of Clairvaux, which Bernard with a band of monks founded in the diocese of Langres in 1115. One sister alone remained behind; she was married, and loved the world and its pleasures. Splendidly clothed, one day she came to visit Bernard, and he refused to see her. He finally consented to do so, not as her brother but as the minister of Christ. The words he then spoke moved her so deeply that two years later she retired to a convent with her husband’s consent, dying later in the reputation of sanctity. 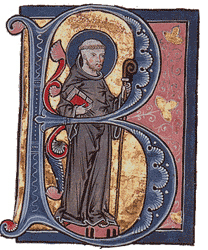 Bernard’s holy example attracted so many novices that many other monasteries had to be built. Unsparing for himself, he at first expected too much of his monks, who were disheartened by his severity. Soon perceiving his error, he led them forward to wonderful perfection by the sweetness of his correction and the mildness of his government. In spite of his desire to remain secluded, the fame of his sanctity spread far and wide, and many dioceses asked for him as their bishop. Through the help of Pope Eugenius III, his former subject, he escaped this dignity. Nonetheless, his retirement was continually invaded. The poor and the weak sought his protection; bishops, kings, and popes applied to him for advice; and at length Pope Eugenius himself ordered him to preach the crusade. By his fervor, eloquence, and miracles Bernard kindled the enthusiasm of Christendom, and two large armies were organized. Their defeat was only due, said the Saint, to their sins, but many had saved their souls by their dedication to the glory of God. Bernard died in 1153. His very precious writings have earned for him the title of the last Father of the Holy Church and one of its most famous Doctors. We beseech Thee, O Lord, that heavenly grace may give increase to Thy Church, which Thou were pleased to make illustrious by the glorious merits and teaching of blessed Bernard Thy confessor and abbot. Through our Lord Jesus Christ, Thy Son, Who liveth and reigneth with Thee in the unity of the Holy Ghost, God, Forever and ever. Behold a great priest who in his days pleased God. V. There was not any found like to him, who kept the law of the Most High. Alleluia, alleluia. V. Blessed is the man that endureth temptation: for when he hath been proved, he shall receive the crown of life. Alleluia. At that time Jesus said to Peter: ‘ Follow Me.’ Peter turning about saw that disciple whom Jesus loved following, who also leaned on His breast at supper and said: ‘Lord, who is he that shall betray Thee?’ Him therefore when Peter had seen, he saith to Jesus: ‘Lord, and what shall this man do?’ Jesus saith to him: ‘So I will have him to remain till I come, what is it to thee? Follow thou Me.’ This saying therefore went abroad among the brethren, that that disciple should not die. And Jesus did not say to him: He should not die; but: ‘So I will have him to remain till I come: what is it to thee?’ This is that disciple who giveth testimony of these things, and hath written these things: and we know that the testimony is true. Receive, O Lord, the gifts we bring to Thee on the feast of him, by whose pleading we hope to be delivered. Through our Lord Jesus Christ Thy Son our Lord, Who liveth and reigneth with Thee in the unity of the Holy Ghost, one God Forever and ever. We who have been refreshed by heavenly food and drink, humbly entreat Thee, O our God, that we may be strengthened also by the prayers of him, in whose commemoration we have received them. Through the Lord Jesus Christ, Thy Son, Who liveth and reigneth with Thee in the unity of the Holy Ghost, one God For ever and ever.